Handle and manage of your Windows 10 devices with ease! 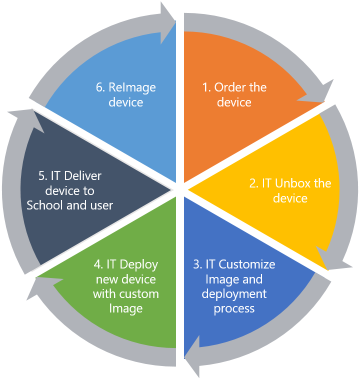 Traditional way of ordering, deploying and maintaining a Windows 10 device is changing. We need to rethink how we deliver this service to our end-users. Especially the youngest ones! We in CTGlobal have taken Microsoft Technology and combined it with our extensive knowledge about Enterprise Client Management and created a concept that is easily implemented in your organization. The user unboxes the device, logs on and gets all necessary settings and applications delivered from the cloud atomically in a fast, secure and intuitive way. If we take a look at schools, we believe that this approach is the best way to deliver devices and services in the hands of the Students in order to make them as productive as possible as fast as possible without having to involve IT Processes like ordering, unboxing and imaging the device. Over the past 5 to 10 years there has been a great shift in Norwegian and international schools where governments are pushing Technology into the classrooms aiming for that 1:1 ratio between computer/tablet and student. This is a big change in how the students interact in the classrooms and how they gain new knowledge. All the way down to 1st grade we are starting to see computers and tablets being introduced as the number one learning tool next to the traditional way with Pen and Paper. This is a great idea, but it introduces some challenges and strain on IT that we have not seen before where a computer traditionally has been an “Enterprise Grade Product”. Where IT earlier would focus on bringing solutions to adult users, they now must customize and adapt their services to include users as young as 6 years old. In traditional IT organizations processes are used for installation, customization and deployment of devices that are not automated and cause the staff a lot of manual effort. This traditional process has worked in the industry, especially in larger organizations that have standardized processes and procedures for device deployment. Additionally, these organizations have also standardized on a vendor and type of devices they will have in their enterprise. This is all done in an effort to keep operational costs at a minimum and reduce the number of images that staff will have to deploy. These activities are often left to the administrative part of the organization and sometimes is delegated to the older student users. An additional concern is the growing number of devices. In Norway, every teach can have up to 30 students and in some schools the number is higher. Suddenly over night the number of devices to order, unbox, configure, deploy and maintain increases exponentially and causes an overwhelming burden on IT Staff. We must look at alternative delivery methods to automate this process and move away from traditional deployment methods. So, how can we change the process and move away from IT delivering ALL the services and devices, into a “Bring your Own Device” / “Choose your Own Device” (BYOD/CYOD) approach, where IT only orders the device and it is delivered directly to the student? Now, with Microsoft Cloud Platform Technology and Windows 10 this is possible. We at CTGlobal have used our extensive knowledge with Enterprise Client Management, our many years of experience and combined that with the latest technology from Microsoft to create a new modern methodology that will allow you to introduce a more cohesive and automated process to your organization. 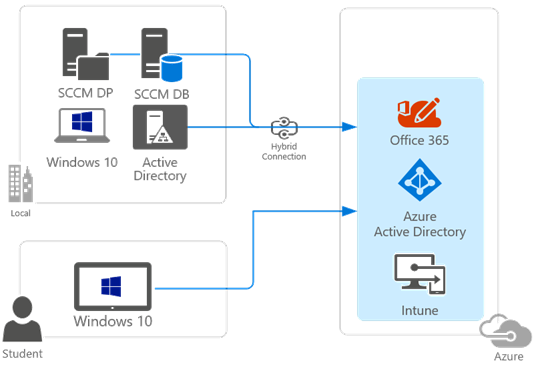 This process can be implemented by extending you’re On-Premises Datacenter Services like Active Directory and System Center Configuration Manager out to the cloud, creating a Hybrid environment and utilizing Cloud services like Azure Active Directory, Intune and Office 365 together with Windows 10 Education. This allows students to open a device and log on with their own credentials and start being instantly productive from the start, without the device ever having been touched by internal IT. Let’s take a look under the covers at the technology. As mentioned, your organization needs to extend its IT-services out to the Microsoft cloud on order to accomplish this. This can be done by either having all services in the Cloud or by creating a hybrid environment where you keep your existing On-Premises Datacenter, but you extend and connect it with Microsoft Cloud Services. If you for instance already have a System Center Configuration Manager environment where you deploy Windows in a traditional form then you can continue doing this, but you can extend your System Center Configuration Manager solution out to the cloud where you get the new options of managing devices, delivering applications and policies without the need of the device ever touching base with internal IT – potentially saving money as you do not have to deal with the overhead of customizing anything for the device or the need to have the devices deployed in a traditional manner. Contact your local CTGlobal Office for more information about the solution. Our friendly and knowledgeable CTGlobal staff will be happy to tell you more about our solutions and the technology behind it. Set up a demo or workshop today.